The last time I was on Tatooine as Luke Skywalker it was in 1992 on my Super Nintendo playing Super Star Wars and I was ten years old. It was a great time and brought me wonderful memories as a young fan. Fast forward to 2015 and this time it’s my oldest son who has just turned ten years old and swinging Luke’s saber and taking on adventures. In Disney’s latest Infinity game, Rise Against the Empire, not only do you play as Luke, but his sister Leia, Han and Chewbacca, and even Darth Vader himself! The character figures look great and are sculpted to blend seamlessly right on your screen. The designs are all great and very playful and true to their film counterparts. Luke: Very much the farm boy on a grand adventure and ready for action using his lightsaber and the Force! Leia: Quick and blasting without hesitation, she holds her own and fun to team up with others. Han Solo: With heavy blaster in hand, he shines as the tough space scoundrel he is. Chewbacca: The lovable Chewie is a powerhouse and ready to assist his friends or take the lead with his bowcaster. Darth Vader: As big and imposing as he is on the screen, just Vader’s breathing puts goosebumps on your arm and thrusting his red saber amplifies the game play! The campaign mode blasts off with running around Mos Eisley, racing speeders with Biggs Darklighter, and purchasing transportation on the Millennium Falcon. And that’s just the beginning as players can explore deeper into the original trilogy and play all kinds of memorial moments as these classic characters. While the world of classic films is open and diverse and very fun to play, it’s the idea of being able to play the Toy Box 3.0 mode which allows players to switch between any characters on the open world play. How about Han Solo in the Wild West? The best part, in my opinion, is being able to mix and match the characters from through out the Star Wars saga! It was a great time for all from ages from ten to four! They even let me play for a little bit and let me be Vader and wreak havoc with the Force and throw his light saber. As fun as playing as the dark lord was, it was the lovable wookiee, Chewbacca that won out as the favorite among the kids. 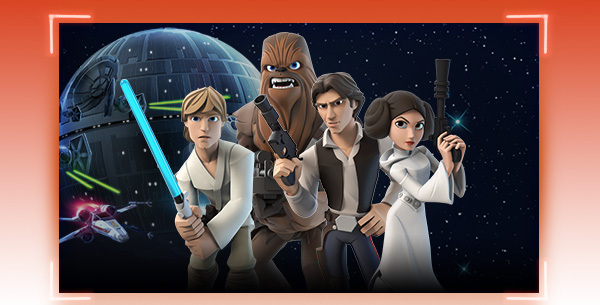 If you’re on the fence with getting into Disney Infinity set, version 3.0 is a great way to dive into Star Wars and relives the nostalgia all characters and adventures bring. With Rise Against the Empire players can immerse themselves in the saga of Star Wars and Disney and have a blast while making memories for themselves. Click on the links below to get hooked up and journey into the Star Wars saga! Thanks to Disney and Lucasfilm for the review copy of the game on PlayStation 4!